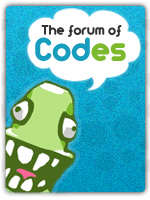 Hi for my forum I would like a code that allows EXP points to level members up, in which when they reach a certain amount of EXP Points, there will be something above it saying "Level: x"
Ok well on my forum with the forumotion function I have EXP. Points set up and they get a little bit of exp each time they post more and more and more. With this EXP as it goes up and up from posting I would like something called Level and when someone gets a certain number of EXP Points, their level number goes up to the next one. It would require server-side scripts and a database to manage. So its not possible on forumotion.